In this review, we put the pieces togaether in the Atari 5200. We find out what it’s like trying this action game. This game was released in 1983. It is a port from an arcade game. In the game, the protagonist’s girlfriend is being chased by a monster. It is up to you to save her. Lucky for you, you are an inventor, so you can build a machine that stops the monster and save your girlfriend. When you start a level, you’ll have a number of things in front of you. The first thing to look at is the blueprint. This is found in the bottom middle of the screen. This blueprint details what the device looks like when complete. Meanwhile, on the bottom right, is a pit. This pit serves as a dumping ground for any bomb you might encounter. If you end up finding a bomb, you have a limited amount of time to get to the pit to dispose of it. An additional thing to point out is the fact that the pit has monsters. While the monsters themselves are harmless, they are capable of eventually going to the blueprint and messing up your progress. To get rid of the monster, you need to catch it and drop it back down the pit. The final part in the lower potion of the screen is the start button. Once you have completed the device, you’ll need to hit this button to start it up. Just below the start button is your fast running gauge. If you press and hold down a button, you’ll be able to run. The downside is that you can only run for a limited time. Once this meter runs down, you’ll be too tired to run and have to walk until you either complete the device, die, or find an additional part. For every additional part you find, you’ll get a small bonus for running time. This leads us to the main objective of the game. Before you is an entire maze of houses. 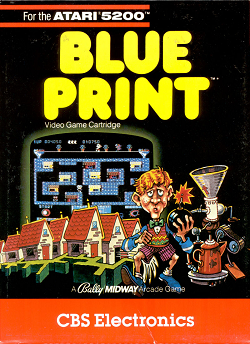 Each house either contains a part or a bomb. In the beginning, a vast majority, but not all, of houses contain parts. It seems that about two of them only contain bombs. All of the remaining houses have parts for your device. Once you collect that part, the only thing that can be found in that house is bombs, so you don’t want to duplicate houses unless a monster is getting ready to make a run out of the pit. If you happen to find a part, you’ll be awarded 1,000 points. You need to drag this part back to the blueprint and drag it in place. If you get the flag, you’ll need to drag the flag to the outline of the flag. If you get a part of the stack-like part, you need to drag that part to the stack portion on the blue print. Eventually, you’ll complete the device. Once you do, you must then run to the start button to start it up. This leads to the next part of the objective. Throughout the time you were assembling the device, the monster has been chasing your girlfriend. Unfortunately for you, she doesn’t run for an unlimited amount of time. As she grows tired, the monster will gradually catch up to her. If the monster catches her, then you’ll die of heartbreak. So, you’ll need to stop this monster within a certain time limit. To do so, after you activate the device, you’ll need to take the monster out. To do so, you need to fire objects at this monster. This device is many things, but accurate, it is not. You’ll need to fire as the monster is passing by. Hopefully, you can take him out. Sometimes, you can get him on the first shot. Other times, it takes a very long time to finally fire a reasonably accurate shot. This requires a lot of luck more than anything else. If you hit the monster, you get bonus points and have a chance to move on to the next round. If you complete two rounds, you’ll even get an animation. No idea if there is more than one. This may sound more complex than your average Atari game, but there are elements in this game that further complicate matters. One annoying factor is the flower pots along the top of the screen. At random times in the game, the monster on the top will hit the pot and have it come crashing down at you. Sometimes, you don’t have any time to react. Other times, you are able to take refuge in one of the houses and wait for the danger to pass. So, there is a certain element of luck in evading these attacks. Further into the game is the wandering monster. This monster will explode and kill you if you touch it. So, evasion is key. The good news is that this monster is slow moving. The bad news is that the monster in question is more than capable of blocking your path. Bad enough if you are waiting with a part, but even worse if you happen to have a ticking bomb in tow. The one thing that helps is the fact that you start with three lives. For every 10,000 points, you gain an additional life. It ‘s certainly more than possible to get enough points to extend your play by a life or two. Generally, for me, with good runs, I can average about 1 or 2 extra free lives. Generally speaking, this game is certainly more complex than a lot of Atari games I have been playing. Most of them just have items to collect, enemies to avoid, and repeat through the same level or three until the game gets too difficult for the player to survive. While there is that element found here, this game ends up being much more like a complete game. Part of the much-needed complexity is the fact that the neighborhood actually changes configuration between levels. Not only that, but the color pallet changes as well. Because of this and the additional obstacles, it makes it so that each level had some thought put in. The downside to this level of complexity is the fact that the learning curve is steeper. It took a while for me to figure out how to get pieces and place them into the correct spot on the blue print. It also took me a few lives to figure out what to do with the bombs. Although you’ll likely spend a round or two just figuring out what to do, the game can be figured out. It’s just getting over that initial phase of “what do I do now?” part that can be a little bit iffy. One criticism I do have with this game is that the controls are less than responsive from time to time. Sometimes, it takes a bit for the game to figure out that you decided to change direction. This can lead to you running into a house you know has nothing in it. So, you do have to compensate a little for the less than stellar responsiveness. Another criticism is that certain elements rely on luck. Evading the flower pots while on the top row is a big one. The other big one is using your machine to fire at the monster to save the girlfriend. Some shots just bounce randomly away from the top row which can be annoying. I wish it had at least a rhyme or reason to the firing system beyond firing one shot at a time. The cut scenes seemed to be a bit of a ripoff of what is found in Pac Man to me. I’m sure there might have been ways of using cutscenes that seemed like less of a riff of Pac Man, but this game hardly hides this. Swap the monsters for ghosts and the inventor for Pac Man and you, well, have the Pac Man cut scenes more or less. Still, this is definitely a much more fulfilling game than many Atari games out there for its time. There’s a nice level of progression. The complexity may have a learning curve to it, but it does keep the player occupied nicely. The controls may not be the most responsive at times, but the constantly evolving level configuration is certainly great to see. So, this game provides a great, if flawed, experience. Graphically speaking, this game is great. The characters are easy to make out (minus the monsters). The graphics do not get in the way of game play that I noticed. The objects are easy to make out and things are well drawn out. The constant changing of color pallet for each neighborhood works nicely to keep wit the theme of level progression. A great experience overall. Though this game has jingles, it also features a decent selection of music for its time. Most games at the time just have sound effects and maybe a jingle or two. This game features a full library of music during gameplay. The sound effects were nicely done as well. Not much to complain about here. Overall, this game offers a great, if flawed experience. The cut scenes do seem to be a bit of a Pac Man ripoff. The learning curve suffered from the complexity, but in the long run, this game does offer a much more fulfilling experience than many other Atari games floating around at the time. Some parts of the game did rely a bit too heavily on luck, but the progression of level configuration really made it look like solid thought was put into each level. The graphics were great and the sound features an actual bank of music that isn’t bad. Overall, a great game here.